RELAY FOR LIFE — Two of the main events at the Boone County Relay for Life last Saturday were the Survivor’s Lap (top photo) with about 15 area residents walking the first lap, and the 5K run (lower photo) with about 30 participants. 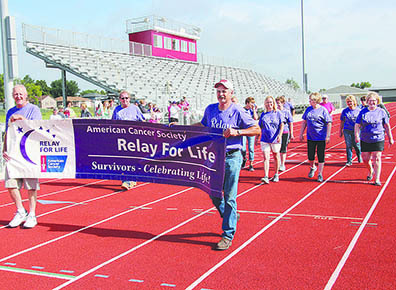 The annual event at the Boone Central track raised about $15,500 for American Cancer Society research and assistance. That was a primary message from Jim Sizemore of Lincoln, guest speaker at the 2018 Boone County Relay for Life last Saturday morning, June 23, at the Boone Central High School track. About 100 Boone County area residents gathered for the annual effort to support to cancer patients and care givers, and to raise funds for American Cancer Society research and assistance. About $15,500 was raised Saturday to support the fight against cancer. 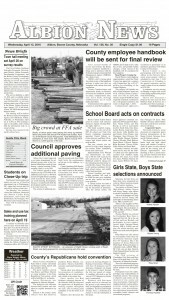 Additional funds were raised at a Knights of Columbus post-event breakfast on Sunday. Sizemore went through a seven-year cancer journey with his wife, Dianne, who had cancer three times during that period. Her approach to battling the disease was always faith-based, he said.